Unfortunately The Vryll Society have cancelled their tour. Refunds available from the point of purchase. We kick off Independent Venue Week 2019 is style with The Vryll Society! IVW is a week long celebration of grassroots music venues across the UK, and we’re very pleased to be bringing one of our favourite guitar bands to the party. “Shimmery psych guitar, spacey grooves and indie falsetto vocals. Ones to watch. ” Mojo Magazine. One thing The Vryll Society aren’t short of is admirers, Lauded at just about every turn by press and public alike, the release of their debut LP for Deltasonic Records has brought great critical acclaim loads more fans and has led to sold out shows on their recent UK tour. Discovered and nurtured by the late and much missed Deltasonic founder Alan Wills, they fitted the type for him perfectly. He instantly saw in them similar attributes he’d previously found in the early days of The Coral. The confident swagger, the solid union formed by their band-of-brothers gang mentality, their willingness to stand outside the conventional and often stifling jangly Liverpool scene, and the work ethic. Always the work ethic. That unit have spent the intervening time creating and honing their own brand new-psych sound, and building up a fanbase with their superlative live shows. 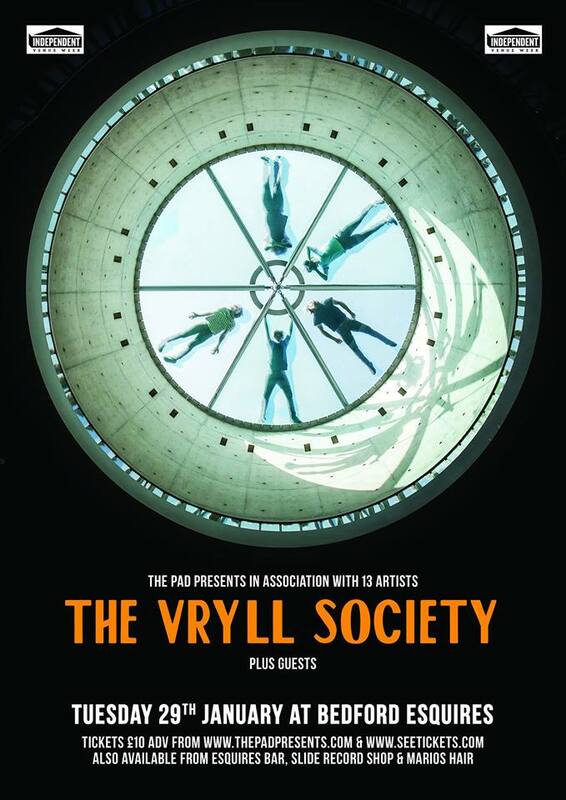 Live , The Vryll Society are a formidable force as seen on their recent UK tour with sold out shows across the UK they have begun to see a groundswell of fans growing fast. Crowds singing their songs along with them is what they have been working towards and is making their unique live shows unforgettable. Drawing from an eclectic palette of influence from deep funk to Krautrock, electronica and prog, they’ve created a heady, intoxicating, pin sharp, and tightly wound groove, It is at once blissful, dizzying and madly infectious. It’s that eclecticism, that kaleidoscopic swirl of influences which brings together hip hop flavours, with the prog stylings of names such as Aphrodite’s Child and The Verve – pre Urban Hymns – when the drugs were still working. Their gang mentality binds them together over the ideas formed by spending long hours together in the rehearsal every day. Hotwiring these ideas into the heads of the crowd through extended psych jams and deep solid grooves gives a different show every time, and with each and every set, the offer gets better. The songs that fill the delicious grooves of debut album “Course Of The Satellite” weren’t so much written as devised or developed, brought together organically over months in the band’s underground lair, or over weeks in Liverpool’s Parr Street Studios. Working closely with producers, Wills’ right hand man and Deltasonic brother-in-arms Joe Fearon and Tom Longworth. The result is a work of impressive confidence and stature. The world is ready, willing and more than able to take The Vryll Society even deeper to their heart. The path Alan Wills showed them awaits. It’s a path that leads to greatness. Tickets are also available from Esquires, Slide Record Shop and Mario’s Hair Design. Doors open 7.30pm – This is a 14+ ages show, under 16s to be accompanied by an adult.